Whether you are craving high-energy tunes to liven your workout, a way of listening to music privately (either at home or at work), an adrenaline-pumping gaming experience or simply a great-looking and -sounding accessory that will help you to express your own unique personal style, you will find a pair of headphones that fit you at Headphones SG. Headphones in Singapore can come in a wide range of styles, and when you consider the equally large number and wide range of ways in which music can enhance your life, it makes perfect sense that you should decide to buy two or more pairs, each for a different use. Here is what you will need to know in order to find your style. These are also known as “around-ear” or “full-size” headphones. They have ear cushions that fit snugly all around the ears and are usually considered the best in terms of overall fidelity. Most models do a good job of cutting off “passive noise reduction,” which is what we call outside sounds. On-ear phones are designed similarly to over-ear phones, but the cushions sit on the outer ears rather than enclosing them completely, while the elasticity of the headband holds them in place. They generally deliver hi-fi sound, but the bass response is lower than in over-ear models. They are also less appealing in that the user can hear outside sounds and conversely, outsiders may hear the music. The proper name for these is in-ear monitors (IEMs), and they fit snugly within each ear channel. Most sports headphones are made in this design. The majority of IEM models come with foam or rubber nubs in several sizes for a custom fit. IEMs are excellent for passive noise isolation, and the fidelity delivered by the higher-end models rivals that of larger headphones. Our last class of headphones feature small drivers that sit loosely on the ear. They usually deliver less fidelity and isolation than other types, though at a highly affordable price. Earbuds come with many portable music devices; those of higher quality make for an inexpensive upgrade (as do higher-quality IEMs). Another name for noise cancellation is active noise reduction. Noise-canceling headphones use at least one tiny microphone to capture ambient sounds, which are then electronically phase-reversed and reintroduced into the output of the speakers, thus effectively canceling out the original sounds in the listener’s ears. Bluetooth is a patented technology that encodes audio signals in digital form and transmits sound wirelessly over short distances. When used with a compatible device, Bluetooth headphones deliver high-quality audio without the hassle caused by wires, which can be very convenient for the wearer who is jogging or otherwise exercising. In recent years, Kleer Audio, a wireless technology that is similar to Bluetooth but is less prone to interference. It has started to gain popularity among audiophiles who want the freedom of wireless headphones without the sacrifice of audio quality. 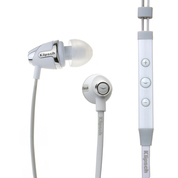 At present, it is most widely used for home-use headphones across a growing number of high-end brands. Biometric headphones are made to monitor your heart rate by gathering information directly from your ears while you are listening to music. Such revolutionary headphones enable the you to keep tabs on your heart rate without having to purchase an additional device which ultimately means you have fewer devices to carry. 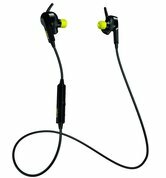 These headphones are typically also sweatproof, waterproof and connects to a wide variety of devices via bluetooth. While some high-end headphones designed for gaming and home theater utilize multiple drivers within each speaker enclosure to reproduce multi-channel surround formats such as Dolby Digital more accurately, most so-called surround headphones use electronic processes to emulate the directional cues of surround sound from only two speaker drives. Bone-conducting headphones bypass your eardrum to deliver sound directly to your ear via vibrations in the bones in your skull. They are particularly useful for those who want to hear the music clearly without drowning out background noise; they are a great option, for example, for joggers who want to be able to listen to their music while still being able to hear traffic or other warning sounds. Some bone-conducting headphones are specially designed for underwater use, enabling you to listen to music while you swim. Many users also claim that the presence of bone conduction reduces the temptation to turn the volume up extra loud and thus puts less strain on the ears. Headsets designed for gaming use often feature a boom-mounted microphone to make voice communication easier during multiplayer game sessions. Portable headphones designed to be used with smartphones and mp3 players often include a small cord-mounted (or “in-line”) microphone, along with controls for volume, mute and track advance. Music is a great motivator. 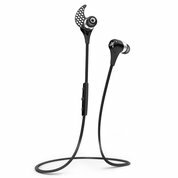 A variety of light in- and on-ear designs have been made to ensure that your headphones remain in place while you are engaged in physical activity. Some feature various kinds of ear clips that hold the drivers in place, while others have a rigid band that encircles the back of the head or the neck. Comfort and fit are, of course, matters of preference, but since such a wide range of options are out there, you are sure to find one that you like. Some sports headphones are made with water-resistant or waterproof materials for protection against sweat and other forms of moisture. There are those that feature cord-mounted or in-line microphones and controls that allow you to take phone calls, adjust the volume or make changes to your playlists without slowing down. 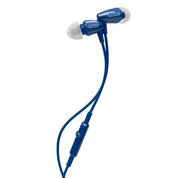 If you are looking for headphones that have no cord at all, try a Bluetooth-enabled model that is compatible with your mobile phone or mp3 player. For serious music-listening, there is nothing like a great pair of over-ear headphones. Their oversize drivers reproduce deep and robust bass tones, and their high-frequency response may extend beyond the range of human hearing to produce a natural sense of “air” and reduce listening fatigue. Because of the way in which the ear cups encircle the ears, these headphones also deliver an enhanced sense of space (often called “sound stage”), in comparison with other styles. Models that have surround-sound processing can enhance the experience for home theater use even further. • “Closed-back” designs feature solid, acoustically-isolating ear cups. They are excellent at blocking out external noise to make for a private listening experience; however, they also color the sound — most notably, they enhance the bass response level. • “Open-back” phones have speakers whose rear is covered by an acoustically transparent mesh or fabric, de-emphasizing low-end thump but delivering an overall “flatter” and more even response of the kind that is preferred by the majority of audiophiles. For those who find the weight of over-ear headphones to be too distracting, engineers have designed high-end on- and in-ear models that approximate the fidelity of over-ear phones. Over-ear headphones are a great way to place some distance between yourself and the clamor of the office, an effect that can be enhanced by active noise cancellation. Alternatively, in-ear headphones, with or without such cancellation, can also isolate you effectively from outside noise while keeping your music — and without messing up your hair! Specialized studio monitor or “reference” Singapore headphones are designed for “flat,” uncolored frequency response that reveals the subtle nuances of a performance. For casual listening, the general preference is a response with extra low- and high-frequency emphasis, so such headphones are recommended almost exclusively for professional applications. 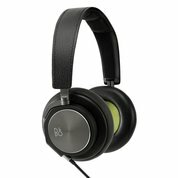 So-called DJ headphones are heavy-duty over-ear cans that have thick, padded ear cushions. They are designed for accurate reproduction at the high levels required for competition with live sound systems. Most DJ phones have ear cups that can be rotated to face outward for single-ear monitoring, and some also come with microphones. Traditionally, in-ear phones are the most popular kind for on-the-go use, but in recent years it has become more chic to sport colorful on- or over-ear cans in public. Companies such as Dr. Dre’s Beats and Ludacris’s Monster, Skullcandy and Soul have developed bold, eye-capturing designs that transform high fidelity into high fashion. Serious gamers who want to create an immersive alternate reality can benefit most from a full enclosure that has deep bass response and high, distortion-free volume, making over-ear phones the natural choice. Many models offer true or virtual multi-channel surround capability and boom-mounted microphones. If you have ever taken a long trip with your children, you have probably wondered if they have headphones that fit them — and they do. Most such phones are made to be extra-durable and come in all types of fun colors and characters designs, besides fitting just right. For safety, many hearing health experts recommend that children listen to levels at 85 or fewer decibels. 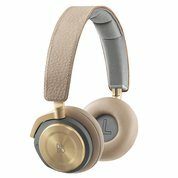 The best children’s headphones, as mentioned earlier, have volume-limiting capacity built in, thus keeping the maximum sound output safe for tiny ears. Great sound is very much a matter of personal taste. What sounds excellent to another person may not sound so to you; thus, the best way to find the best headphones for you is to research as much as possible. Headphones SG carries various brands and models, and our detailed product descriptions provide you an easy way of comparing them. • frequency response (expressed in hertz) — This represents the range of frequencies that can be accurately reproduced by a given set of phones. Audiologists estimate the range of human hearing to be from 20Hz to 20kHz, although many claim to have a frequency response outside that range. Keep in mind that two headphone sets whose frequency response specs are identical will not sound exactly the same; the “signature sound” for each is different, with many factors influencing it. • sensitivity (expressed in decibels per milliwatt) — This figure represents the relative volume that can be produced from a given input power level. Higher-sensitivity phones (c. 100 db/mw or above) are recommended for portable listening devices, whose amplifiers are typically less powerful than those of home audio components. • impedance (expressed in ohms) — Impedance, which is related to sensitivity, refers to the level of electrical resistance. Some studio reference phones have impedance levels as high as 600 ohms, so that reaching desirable levels of listening calls for powerful, clean amplification. 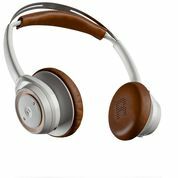 Consumer-level headphones that are made for casual listening are almost always between 16 and 64 ohms, and are designed for use with portable listening devices.